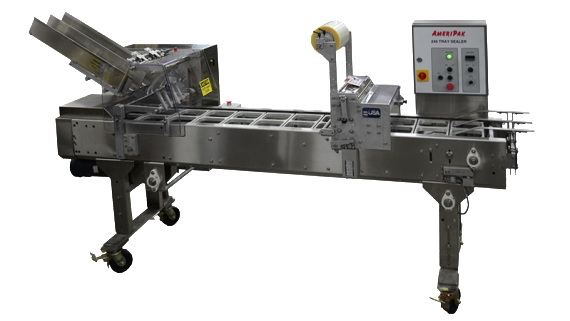 Food packaging has never been easier with AmeriPak tray sealer machines. Sealing packages at a rate of 30-60 units per minute helps automate the industrial packaging system with high levels of efficiency whether you are packaging produce, consumer goods, or fresh, frozen or prepared foods. Each traysealer machine model caters to the specific needs of the packaging environment. 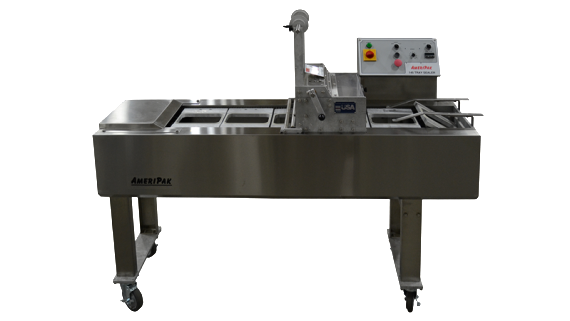 AmeriPak Series 30 Tray Sealer offers a mobile unit with a compact footprint to automate packaging in small spaces for up to 30 packages per minute. The Series 60 provides over 10 inches of seal width to accommodate a variety of sealed packaging size and overwrapper needs at up to 60 packages per minute. The Series 30 is our most compact automatic filled tray sealer, packing a lot of performance into a small foot print. This model is ideal for applications requiring high output from a small physical space, and is mounted on lockable casters so you can easily move it to where you need it. Seals up to 30 units per minute! The Series 60 tray sealers offer film seal width of over 10 inches, allowing to seal containers over a greater range of sizes, often permitting multi-lane machine configuration. Available in Drum or Platen Seal models, Series 60 sealers are a flexible and durable solution for a wide variety of applications. Seals up to 60 units per minute.